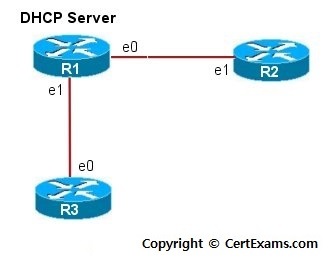 Description: This lab exercise demonstrates DHCP server configuration and DHCP client configuration on two routers and also shows the verification commands both on the server and the client. 2. Create an addressing pool for dhcp called pool1. 3. Isssue network command that specifies the range of IP addresses to be assigned to clients. Use 192.168.4.0 255.255.255.0 in this lab. 4. Assign the domain-name "sample.com" to the client. 7. Set the duration of the lease to 4 days. 8. On router R2 and R3, enter into interface confiuration mode and issue the command "ip address dhcp" that configures the interfaces to acquire IP Addresses from the DHCP server. 9. Use "show interfaces" or "show ip interface brief" command on R2 and R3 to verify the addresses acquired from the server. 10. Use "show ip dhcp binding" command on router R1 i.e, server, to view the addresses assigned to clients. 11. Use "clear ip dhcp binding <client_address>" on the server R1 to clear the specific address assigned to client or "clear ip dhcp binding *" to remove all the addresses assigned to clients. 12. Use "no ip address dhcp" command on clients R2/R3 in interface configuration mode to unconfigure an address assigned on it by the DHCP server. Note: DHCP provides dynamic addressing information to hosts on a network. It allows devices to dynamically acquire their addressing information. The main purpose of the DHCP server is to provide IP configuration parameters to hosts such as the default gateway, domain name, Domain Name System – DNS. DHCP uses UDP protocol. Port 67 for requests and 68 for replies. Note that as per cisco 12.2 release, only ethernet interfaces are supported for DHCP. 1. Issue service dhcp command on router R1 that enables DHCP server feature on router. By default, this is enabled. 2. Select R1 from Select Device drop-down box. In left navigation pane click Router >DHCP > DHCP Pools and click add button. 3. Issue network command that specifies the range of IP addresses to be assigned to clients. Use 192.168.4.0 255.255.255.0 in this lab. 6. Set the duration of the lease to 4 days. 7. On router R2 to acquire IP address from DHCP server Select Router > DHCP > DHCP Bindings select interface from Select Interface type E1 from drop down and click Obtain IP address from DHCP button. On router R3 select E0 interface and click Obtain IP address from DHCP button. 8. Use "show interfaces" or "show ip interface brief" command on R2 and R3 to verify the addresses acquired from the server using View > IOS show command. 9. Use "show ip dhcp binding" command on router R1 i.e, server, to view the addresses assigned to clients. Note: Please refer to the CertExams.com Network Simulator software for complete lab with GUI Interface.